The first Windows Phone 8.1 handset delivers fluid smartphone experience on budget. Excellent user experience; Latest Windows Phone 8.1 OS; Sturdy construction; Elegant design; Offline maps and navigation; Good battery life; Advanced camera controls. Lacks front-facing camera; No camera flash; Doesn't ship with USB cable. The market is flooded with affordable Android smartphones from companies such as Micromax, Karbonn, XOLO, and Celkon. In the 15k segment, Motorola blew the competition out of the water with its power-packed Moto G. If that wasn’t bad enough for the Indian brands, Nokia (Microsoft) has rolled out its first budget quad-core smartphone, the Lumia 630, for an attractive price of Rs 11,200. To keep the pricing in check, Nokia has cut many corners. For instance, 512 MB RAM makes the phone look weak on the paper. However, rather than judging the book by its cover, let’s gauge the phone’s real world performance. Nokia's Lumia line-up is known for bright hues and sturdy construction, and the latest addition is no exception. The Lumia 630 improves upon its predecessor 620's industrial design. The phone has identical rounded corners, but it feels compact due to sharp lines. While adding a relatively bigger 4.5-inch screen, the manufacturer has managed to retain single-handed usability. For 630, Nokia has refreshed the colour palette. You can choose from bright green, orange, and yellow. For those not keen on bright hues can go with the elegant white variant. It also comes in black, but we advise you give it a miss, as it looks incredibly boring. The attention to detail in the manufacturing process is outstanding. Not a single corner or seam of the phone shows up a rough edge. Since the outer shell is made of polycarbonate, you don't have to worry about losing colour — not even if the phone gets scratched. 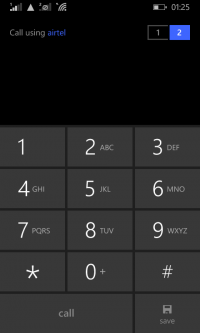 While the key placement is a standard Lumia affair, capacitive navigation keys have been replaced by the onscreen ones. It's also the first WP device from Nokia to do away with the dedicated camera button. The only accessory to ship with the phone is a wall-charger. It boils our Indian blood to see an 11k handset lack earphones and USB cable. Especially, when most domestic brands provide a couple of complementary flip covers and sometimes a spare battery for free. The 4.5-inch IPS screen packs in 480x854 pixels. That makes up for pixel density of around 218 ppi. To put things in perspective, iPhone 5's pixel density is 325 ppi. The 630’s screen is not very sharp, but you're unlikely to see jagged edges unless you're determined to find them. The IPS panel offers great colour reproduction. ClearBlack polarisation filters improve the sunlight legibility so some extend. The screen is protected by Corning's Gorilla Glass 3, so you don't have to worry about it getting scratched easily. What's missing here is the ambient light sensor. To make sure you don't get stuck with only three brightness levels, Microsoft has added brightness profile that gives you total control over luminance. The 630 is powered by Qualcomm's Snapdragon 400 chipset. The quad-core chip is clocked at 1.2 GHz. The phone has 512 MB RAM, 8 GB internal storage, microSD card slot that supports up to 128 GB. Other features include a 5 megapixel camera, dual-SIM functionality, Bluetooth 4.0, Wi-Fi, GPS, and 1830 mAh battery. What's missing here is a front-facing camera. I understand that Nokia must have made this decision to keep the price in check. However, considering that Windows Phone 8.1 comes with tight Skype integration, denying the 630 users video calls is a stupid move. 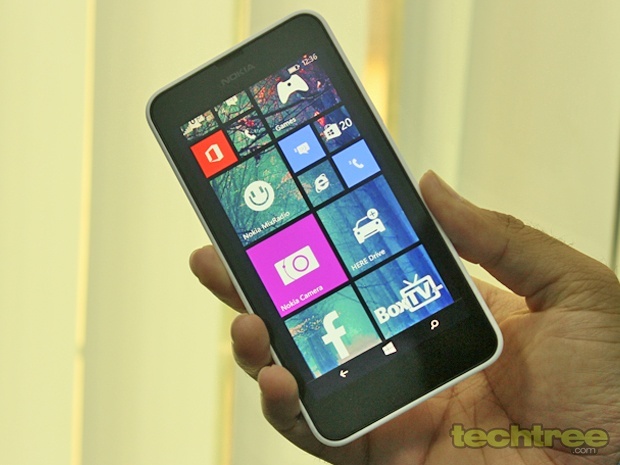 The Lumia 630 is the first Windows Phone 8.1 handset to hit the Indian market. Dubbed as Cyan update by Nokia, the new software comes with a more flexible Start Screen. Users can now set custom background that slides below the transparent tiles. 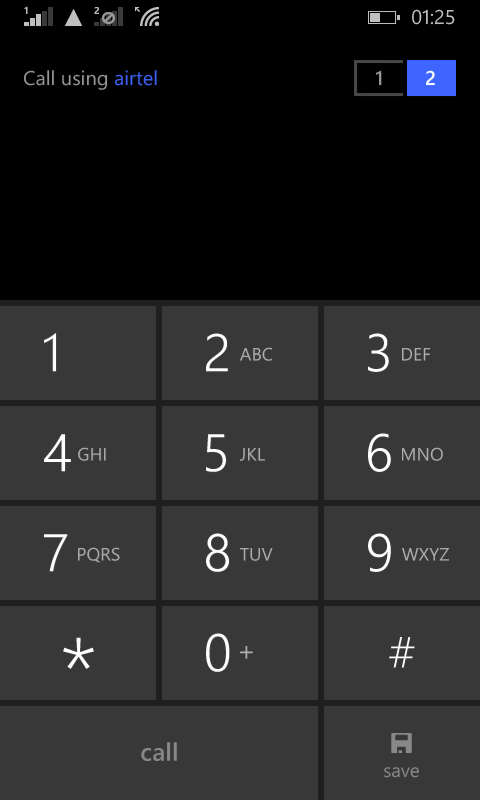 Windows Phone platform is known for its originality. Be it the Start Screen or calendar layout, these elements have been built from the scratch. However, following Apple’s footsteps, Microsoft too has now copied Android's notification centre. Dubbed Action Centre, this swipe-down element not only brings you notifications, but also gives quick access to Wi-Fi, Flight Mode, Bluetooth, and Rotation Lock toggles. Apart from these new features, there are a few usability improvements such as independent volume controls for ringtones and media, download option in Internet Explorer 11, ability to install apps to memory card, Bing device search, and phone back-up. While Cortana isn't officially available in India, you can get it on your phone by following this tutorial. Thanks to the well-optimised OS, the 630 delivers fantastic user experience. During my week's usage, not once did this handset showed any stutter or lag. On 512 MB RAM, Android can be almost unusable, but WP runs perfectly fine. I didn't encounter any stutter while switching between the apps, and latest games including Asphalt 8 worked fine. You will miss-out on top-end games such as Modern Combat 4 and Spider Man 2 that require 1 GB RAM. If you're a gamer, you should stretch your budget by a few grand and go for the Moto G.
If you travel a lot, the Lumia 630 can be your ideal companion. Nokia's HERE Drive+ software lets you download map data for an entire country as well as for individual states. For instance, you can install the India (All) map, which is 950 MB in size, or opt for the Maharashtra/Goa map, that fits into 198 MB. You can avail free voice-guided navigation in offline mode. Here's instead of using network to locate your position, the phone uses satellite triangulation to offer turn-by-turn navigation. The GPS chip only takes around 10 seconds to lock on to satellites. The phone packs in a 5 megapixel camera. It lacks a flash, so night photography is out of question. Similar to the high-end Lumia camera phones, the 630 comes pre-loaded with Nokia camera. It offers advance controls such as shutter speed, exposure, and manual focus. Refocus app, which lets you tinker with depth of field after taking the photograph is also compatible with the 630. More importantly, the photographs turn out to be quite good. The phone records HD video at 30 fps. Saved in MP4 format, these files offer good amount of detail and smooth playback. The Lumia 630 comes with MixRadio subscription that offers free downloads for three months. The FM radio has also been duly covered. One things worth mentioning here is the insanely loud onboard speaker. Coming to the subject of video playback, the 630 can handle Full HD MP4, WMV, and AVI files without any issue. The default video player now supports subtitles. One annoyance here is that software navigation keys remain visible during the video playback. After hours of experimenting, I found out that there’s no option to hide the navigation bar. Come on Microsoft, how can you miss out on this detail? 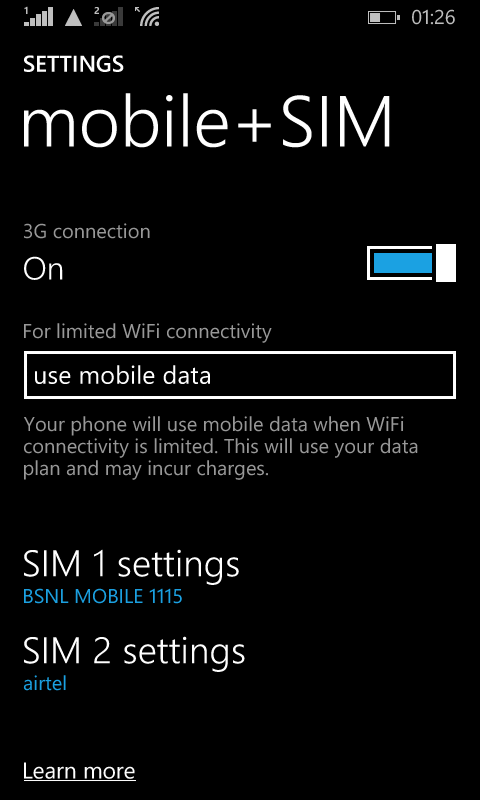 The first dual-SIM (dual-standby) Windows Phone offers elaborate settings. 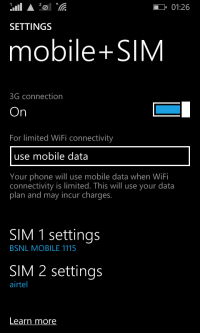 For instance, you can choose SIM for data connection. 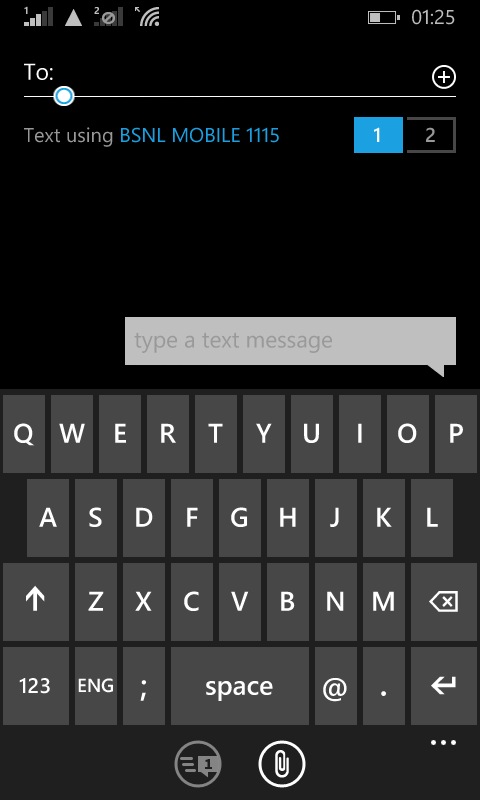 Dialler and compose message screens give access to SIM switch button, so that you can change the SIM anytime you want. The 630 features ‘Word Flow Keyboard’ that lets you type quickly with swipe action. 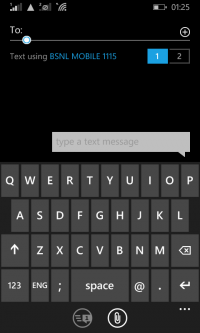 It's pretty much like the SWYPE for Android. Then, there are handy options to block unwanted calls and mute SMS from certain contacts. Last, but not the least, the device's call quality and signal reception is great. The Lumia 630 ships with an 1830 mAH battery. In our HD video loop test, it lasted for over 6 hours. Under normal usage, I was changing charging the battery on a second day. However, I mostly use Wi-Fi for data. Those using 3G will probably have to change charge this phone every day. If you're looking for smooth and sophisticated smartphone experience, go for the 630. For those into gaming, it makes sense to stretch budget to 14k and get the Moto G.